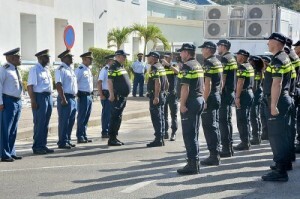 THE HAGUE - Dutch police officers will continue working in St. Maarten until at least September 1 and their number will be increased to 34. Dutch State Secretary of Home Affairs and Kingdom Relations Raymond Knops announced this in an interview with The Daily Herald early this week. An average of 20 officers of the Dutch National Police have been stationed on the island from September last year until March 5, 2018, to assist the St. Maarten Police Force KPSM in executing its tasks. After the hurricane, the Dutch Government sent not only Dutch police officers, but also equipment, including police cars. Last month, the Dutch authorities decided to extend their stay by six months. Initiated shortly after Hurricane Irma to assist the understaffed KPSM, the Dutch police deployment is currently being expanded to 34 officers. Knops said he could not anticipate whether there would be a further extension after September 1. As for the strengthening of the control of St. Maarten’s borders, Knops said this process was taking place through a new cooperation between the KPSM and the Royal Dutch Marechaussee (military police). “The protection of the St. Maarten people against crime from outside and illegal immigration has high priority,” he said. The Dutch Customs Department will be providing assistance with six persons in the next six months. The Dutch Caribbean Coast Guard will be investing in capacity in St. Maarten. The Coast Guard station in Simpson Bay sustained damage during the hurricane and much of the equipment was lost. “We will also have to work more closely with the French authorities. I find it highly important to make investments for the future. That is why, with the help of the Marechaussee, an additional 30 persons will be trained for the border control,” said Knops. The strengthening of the border control was a precondition for the Dutch Government to make 550 million euros available for St. Maarten’s reconstruction after the hurricane. Members of the Second Chamber of the Dutch Parliament André Bosman of the liberal democratic VVD party and Ronald van Raak of the Socialist Party (SP) responded positively to the news from Knops. Both Members of Parliament (MPs) have been clamouring for increased law enforcement and border control to keep criminal elements out of the island. “If this is indeed the case, it is good news,” said Bosman in a reaction. He emphasised that he expected a letter from Knops on this matter soon to officially inform Parliament of the developments. “The reconstruction of St. Maarten after the hurricane is about infrastructure and homes, but also about safety, the reduction of crime and a greater sense of security for the people. I hope that the additional input of Dutch law officers can contribute to this,” said Van Raak in an invited comment. Knops confirmed during a meeting with the Second Chamber earlier this month that extension had been requested for the deployment of 15 persons of the Dutch Judicial Institutions who have been assisting in guarding at the Pointe Blanche prison since the hurricane. The prison building suffered extensive damage, while the understaffing is also a severe problem. Knops and Dutch Minister of Justice and Security Ferd Grapperhaus will be visiting St. Maarten late April. The situation at the prison, the increased border control and the deployment of Dutch law enforcement personnel will be important aspects of this visit.